Here are the figures from the plastic Perry European Mercenaries box. 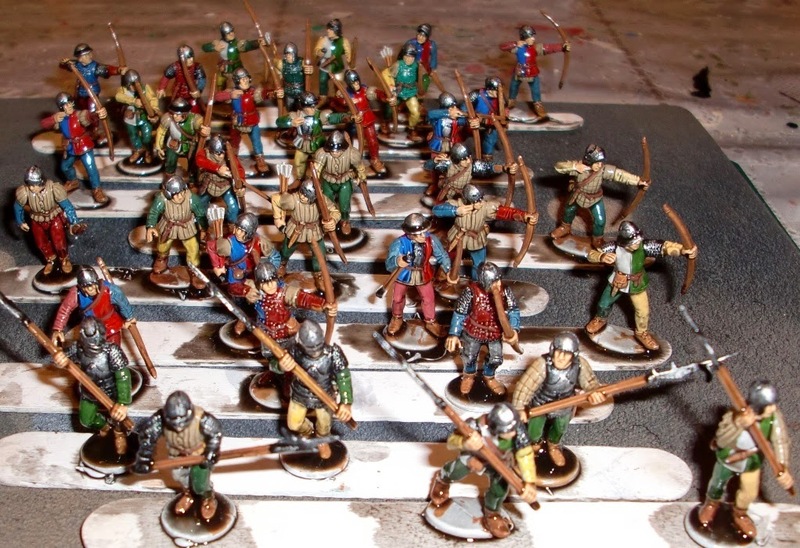 There are units of crossbowmen, handgunners, billmen and pikemen. 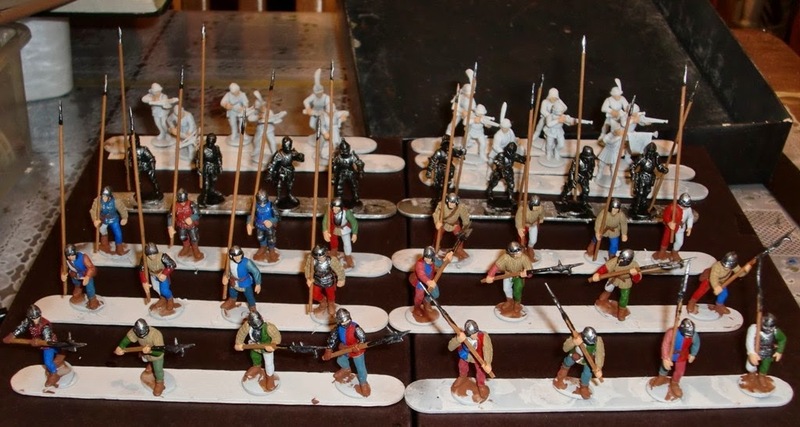 They are painted up as Swiss or German mercenaries, Lancanstrians, Yorkists and Stanleys. I will need to see how they form up on the table top to see if I need to add more units to each faction. A modified and simplified version of Hail Caesar will be used. Most foot units will be two stands of three figures each. This size seems to work well for melee, as well as shooting. The command stands for the divisions are up next. I still need to find some nice banners and flags. Here are the remaining two figures from the plastic Perry sets of the WotR Infantry and European Mercenaries. The one on left is painted up as a musician for Norfolk and the one on the right for Oxford. Both freshly swabbed with Minwax. I see I may need to dab some of the stain off certain areas - like the rear of the cap on the Norfolk guy. And a shot of them prior to the stain. They'll be given a shot of Testors Dullcote as soon as they're dry. These are from the WotR Infantry and European Mercenaries boxes - they are fully armored and are for command figures and or heavy infantry. They've been sprayed with Krylon Brilliant Silver and then given a wash of Vallejo Black Ink/Stain. Other than the silver, leather and flesh areas were picked out and also given a wash. The musician are next. Colors were kept very simple - they could also be used as Empire troops. Below shows how they looked block painted prior to the stain. Fully armored pikemen and a couple of musicians and leaders are next. Thanks for visiting the site. 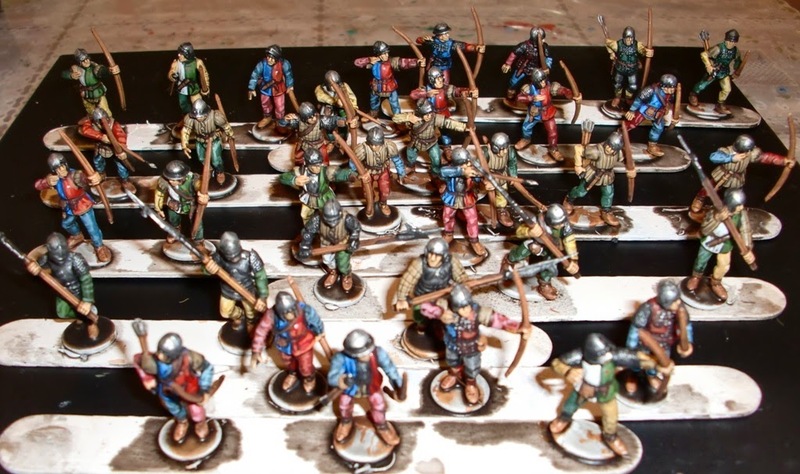 Here are the pikemen (less the fully armored guys) and the billmen - freshly swabbed with Minwax Tudor Satin stain. The pikemen are decked out in possible Stanley and York livery. Some references have the Stanleys in red, yet I've seen some in blue and white. They could also be Swiss Merc colors too. The billmen represent Lancaster and York factions. As usual for the staining method, they figures were block painted prior to. Highlighting will be added once the stain is dried and the figures given a finish of Testors Dullcote. 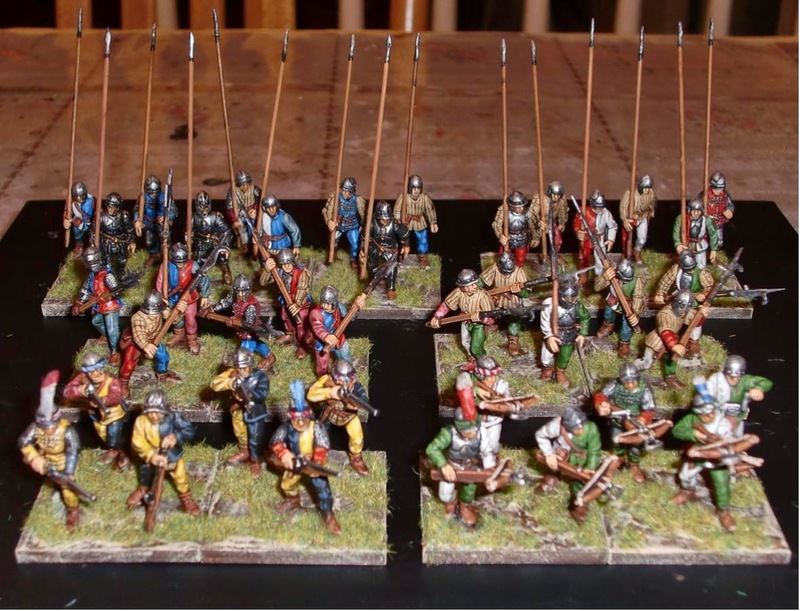 Besides the armored pikemen, handgunners and crossbowmen still need to be worked on. 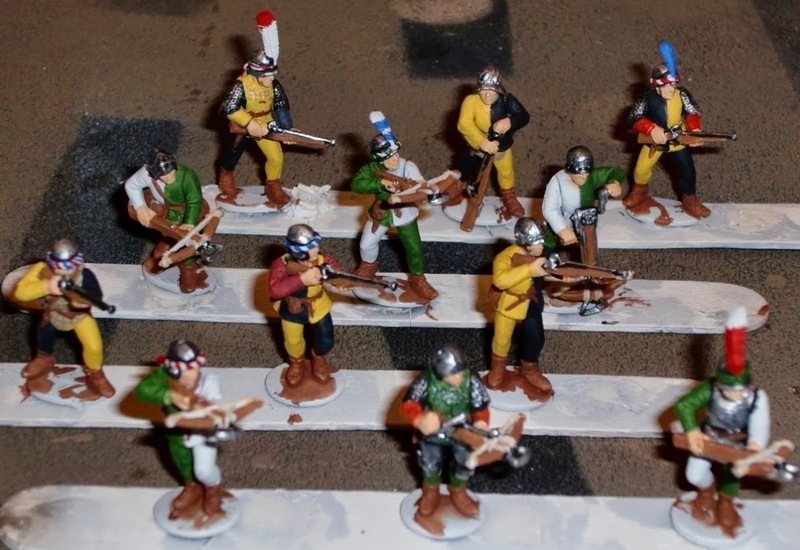 Started on another box of Perry plastics; this time the European Mercenaries set. 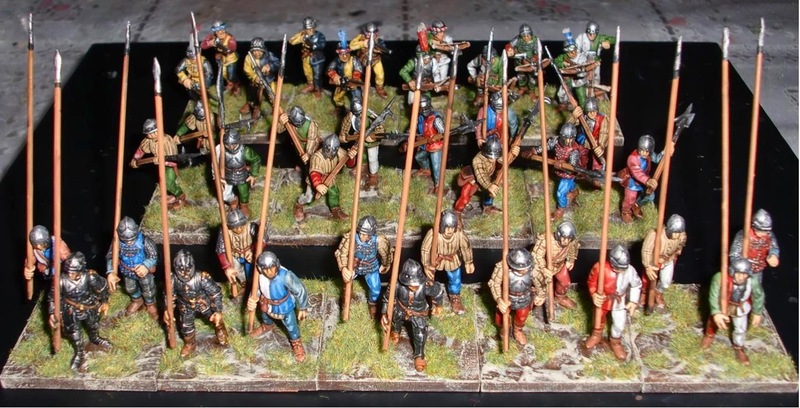 Using the left over figures from the WotR Infantry set I managed to build 18 pikemen, 12 billmen, 6 handgunners and 6 crossbomen. 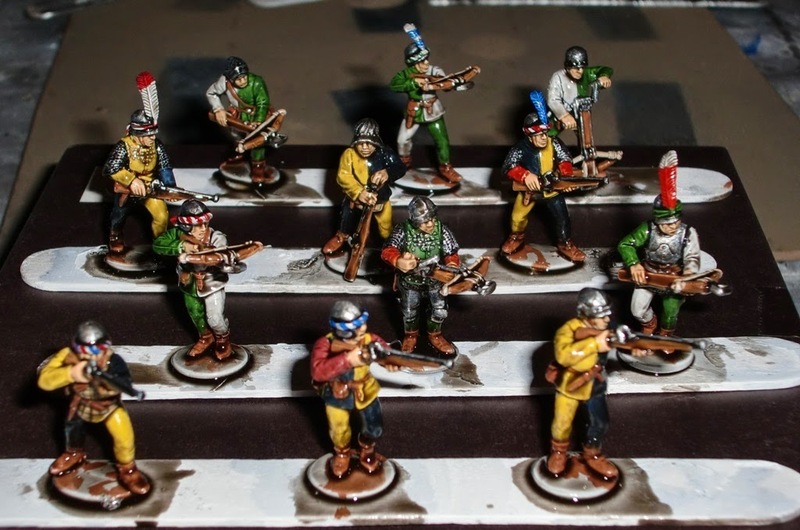 At first I hesitated on building handgunners and crossmen as I have a bunch of earlier period ones and also a bit later one from an Empire army. Alas, I succumbed and put some together. They were given a basecoat of white, except for the ones in full armor which were sprayed with Krylon silver. The full armored guys have been given a wash of Vallejo Black Ink/Stain. The pikemen and billmen were given their basic colors to distinguish them as York, Lancaster and Stanley contingents. The missile troops will be painted as mercenaries. Well, just an initial post with more to follow. Several of the local crew showed up today at the Game Matrix to play some WAB. Although I like Hail Caesar, or at least a simplified version better, I don't mind playing WAB once in a while. This especially so as many of my gaming buddies still like to play it. I cobbled together existing figures for a Campanian army with Pyrrhic allies. There are two Hoplite units, two Oscan cavalry unit - one each with javelins and thrusting spears, one Oscan Warrior unit with throwing spears, a Pyrrhic Guards unit with thrusting spears and javelins, and finally a unit of Cretan bowmen. 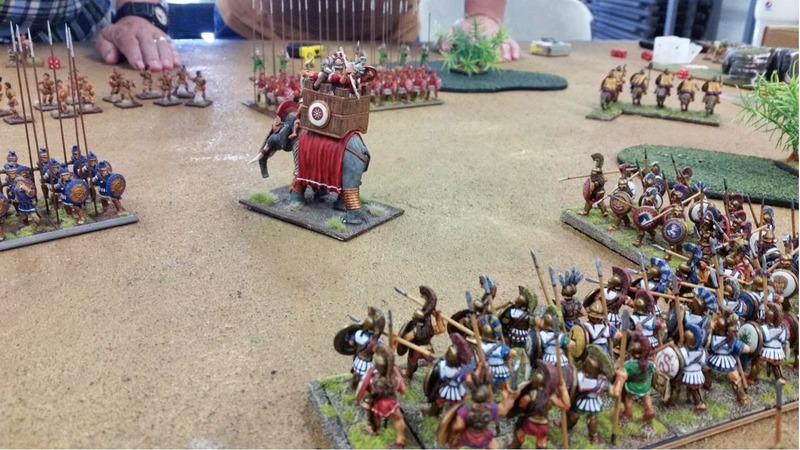 Pat let our buddy Garry G. run his Seleucid army with several pike units, Argyraspids, an armored Indian elephant and several skirmish units. Gary doesn't play WAB, so we wanted to give him a chance to get in on it. We both had 2,500 point armies. 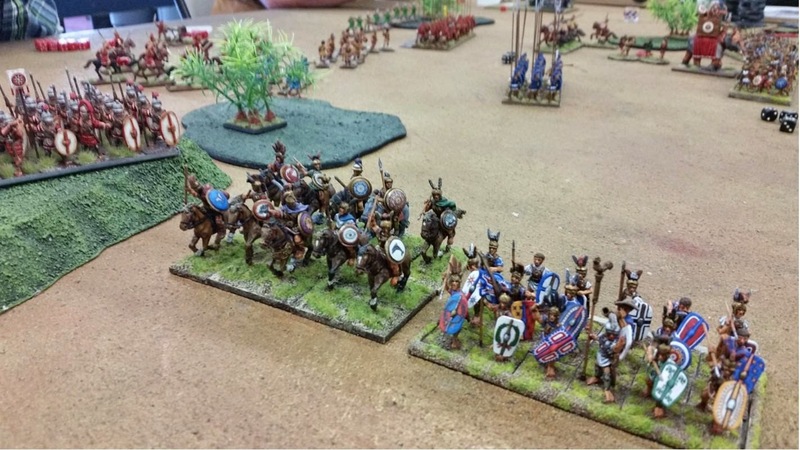 The Campanian left - Oscan cavalry and Warriors - after scaring off the Seleucid light cavalry and Argyraspids. 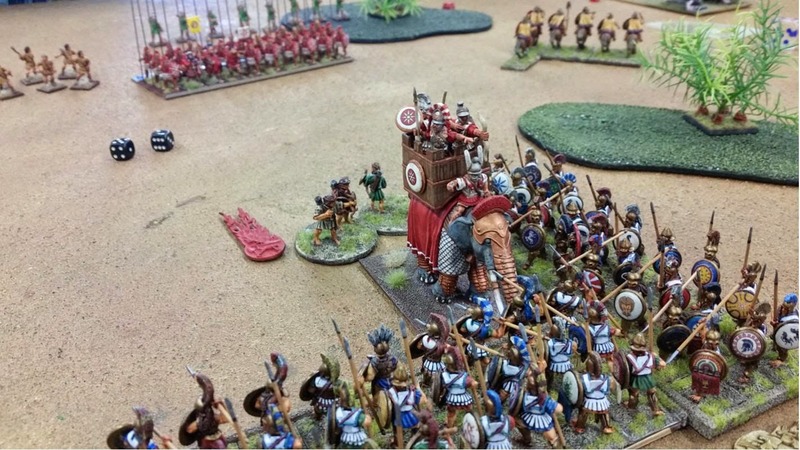 Seleucid Indian war elephant in combat with two Oscan Hoplite units. Earlier, the Pyrrhic Guards had forgotten they were Stubborn and broke after failing their first Break test. The poor elie fleeing after losing combat to the two Hoplite units. The Campanian army arrayed prior to the battle. 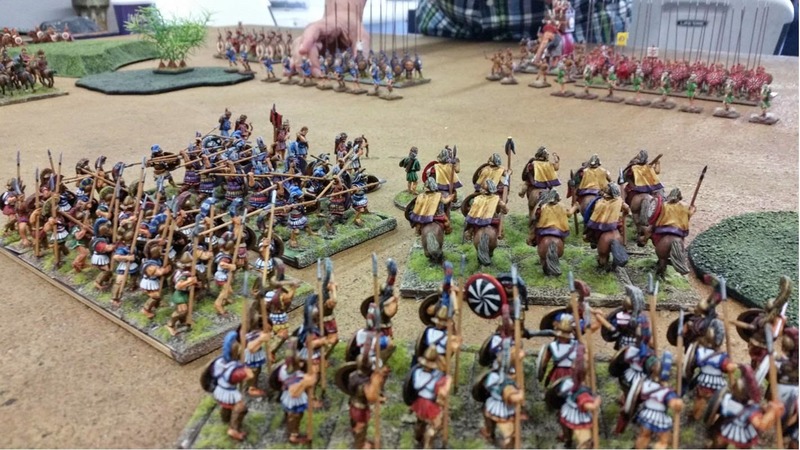 From left to right, Pyrrhic Guards, Oscan cavalry, two units of Hoplites, Cretan archers, Oscan Warriors and another unit of Oscan cavalry. I will likely add a few more missile skirmishers as my initial list had the Army General, Army Standard and a Leader (sub-general) on warhorses in the cavalry units. I took Pat's sound advice prior to this game and put them in the hoplite units. So the majority of figures for this project have been based onto Litko plywood bases. 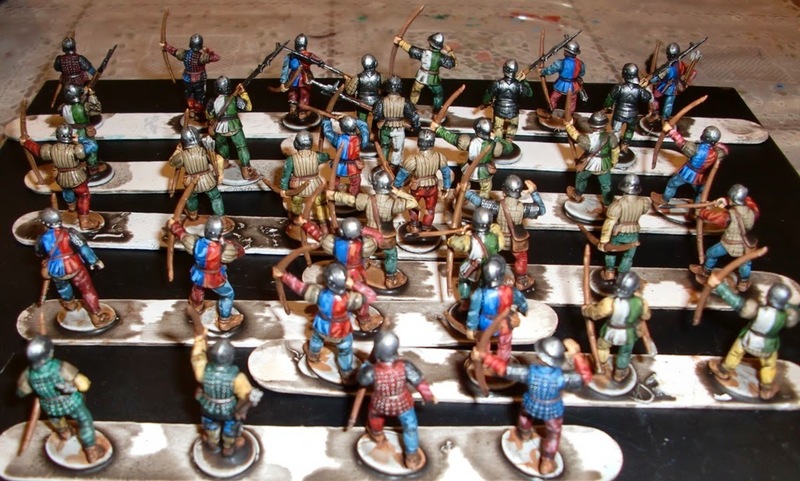 The infantry are based 3-figures per 40mm squares, and the mounted 3-figures per 50X80mm rectangles. 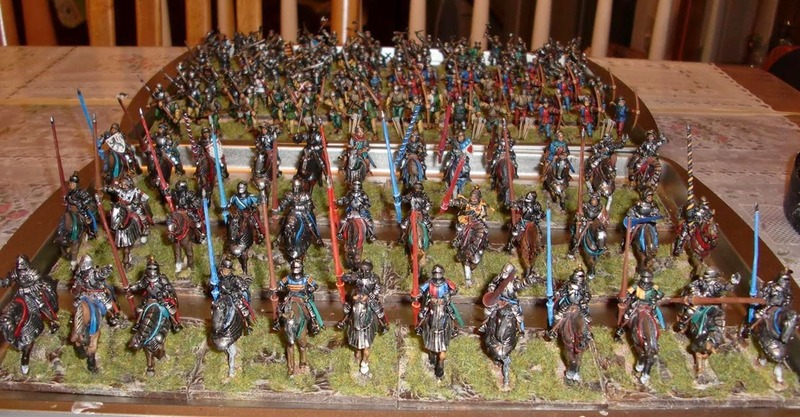 Most of figures are Old Glory from their Agincourt and War of the Roses ranges - the so-called Revenge line. 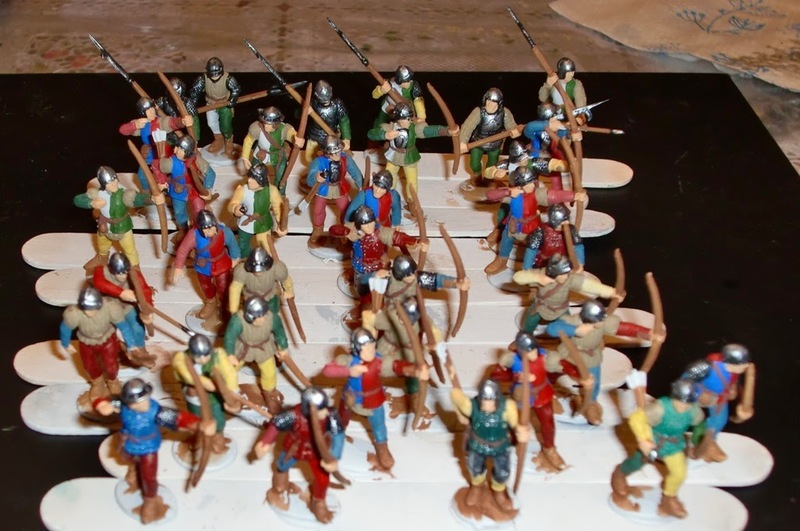 The longbowmen and billmen are plastic Perry Miniatures. I'll likely get box of Perry Medieval Mercenaries and another box of WotR Infantry for this project. I don't plan on having too many missile troops as the scenario I envision will be more of the close-combat portion of this battle. I'm debating how to include the Stanley faction which turned the tide of the battle - "Treason!" Just a quick update of what I've been working on. While waiting for an order of Litko plywood bases to arrive, I've sorted out some existing figures after removing them from individual bases. Besides the Perry plastics, metal Old Glory figures that were based for a French HYW WAB army will be used for this project. Some of the figures are in older armor - Agincourt period - but will represent French mercenaries in Henry Tudor's "invasion" force. All of the mounted knights/MAA previously had flags on their lances. They'll be based 3-figures per 80X50mm bases - and will be generic enough to use in various armies. I'll probably get another box of Perry infantry for a few more billmen. 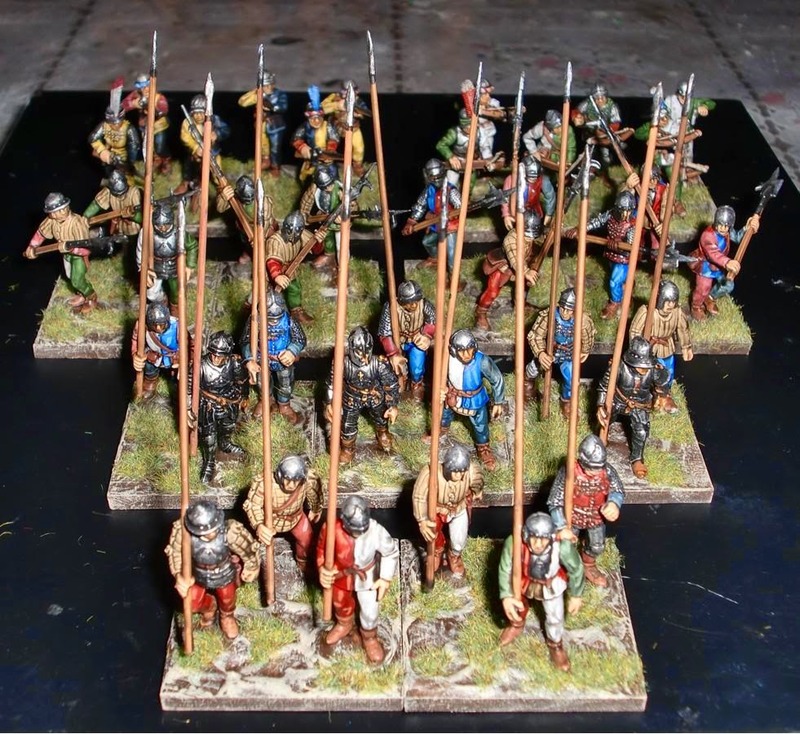 I may also have to get the Mercenaries box too, as the crossbowmen and handgunners I have are from the Agincourt and earlier period. Too bad puffy sleeves came in a bit later, or I could use the WHFB Empire guys :)! Actually, the scenario will not need too many missile troops. The majority of shooting will occur in the opening turn(s). The bowmen will be allowed "Arrow Storm" - i.e. double the shooting dice the first time they fire. After that it would behoove them to retire behind the heavy infantry as the bowmen's hand-to-hand and survival qualities will be much lower than the billmen and knights/MAA. This I think was historical in the War of the Roses. That is, both sides pretty much cancelled any advantage of longbow fire as they both sides used them. 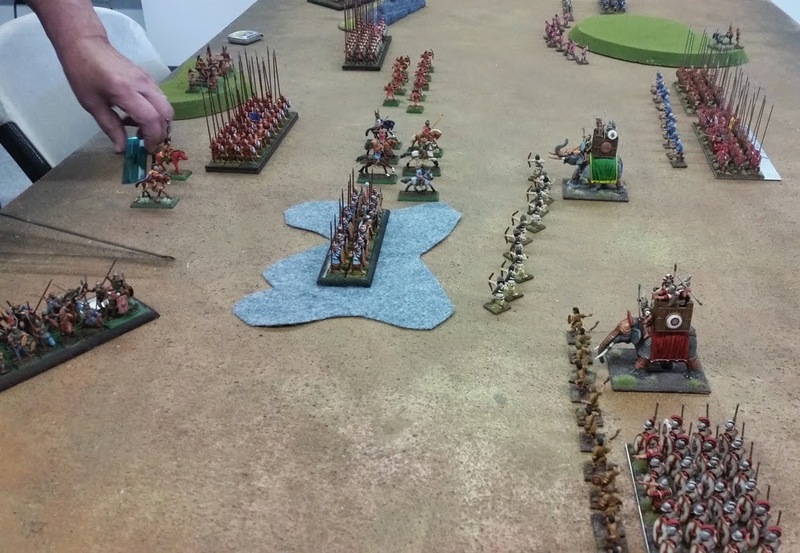 Stopped by the Game Matrix in Tacoma for my first Warhammer Ancient Battles (WAB) game in over a year. 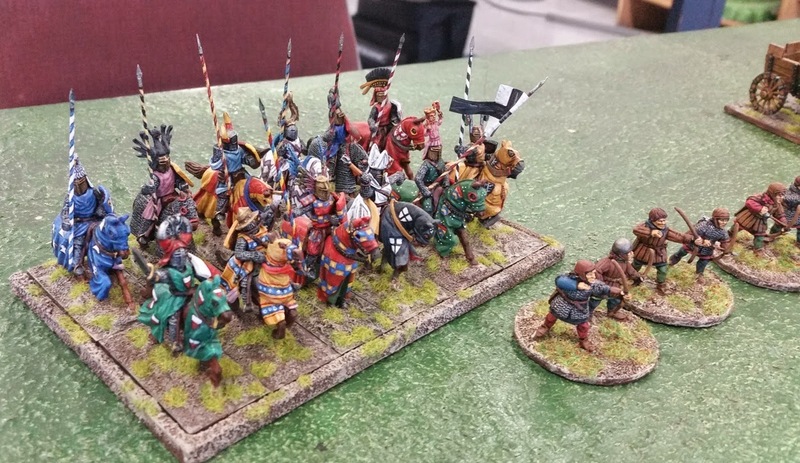 My buddy Scott A. and I had wanted to play a game using our late-13th/Early 14th C. Medieval WAB armies for quite some time. Today, we finally got around to actually getting a game in. My army is based (loosely) on the army led by Siegfried, the Archbishop of Cologne at the Battle of Worringen in 1288. Scott's was going to be a similar one, but ended up changing it to an Ordenstadt (Teutonic) army after WAB 2.0's Armies of Antiquity came out. I kept my army pretty much the way it was listed in the old Armies of Chivalry supplement as an Early-Holy Roman Empire army. 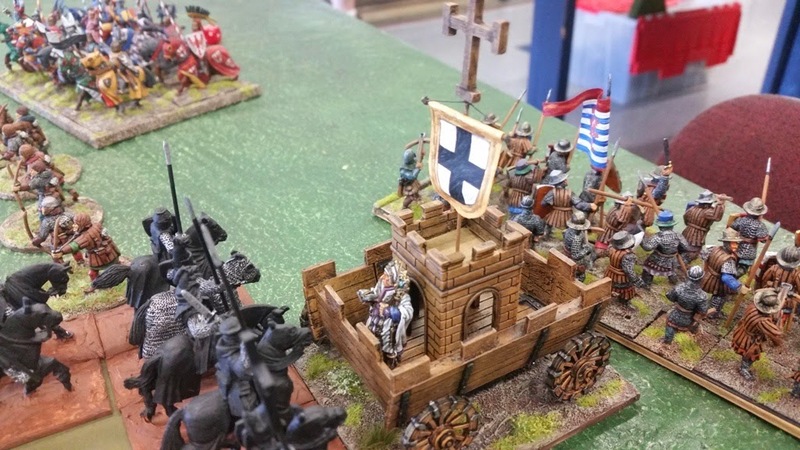 Here it is with a carrocio - which is basically an Army Standard wagon in the rules. On the far right flank is a unit of Szekler Hungarian light cavalry. Below is a close-up of the unit of knights led by the Archbishop.The heraldry is taken from the Codex Manesse. Early on, I recalled how much I disliked not only individual casualty removal, but also the tedious (to me) shooting and combat resolution - not to mention the multiple attacks of his Army General and those of the Warhorses. 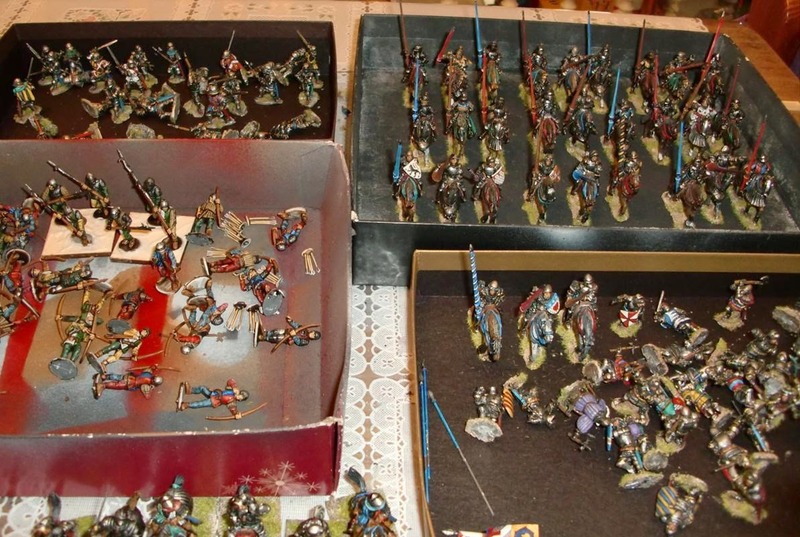 Scott ended up charging his Order Knights into my center unit of mixed order infantry - crossbows and spearmen. Although I managed to take out a few of his knights by mainly crossbow fire, the knights ended up defeating and breaking the infantry. The broken infantry unit being within 12" of most friendlies, required multiple Panic tests. Siegfried himself failed his Leadership test of 9 - even with a re-roll using the Army Standard. The first roll was an 11, and the re-roll 12! In fact, I rolled very high for most of the Leadership tests during the entire game. We called the game after the 5th turn, after Scott had captured my Army Standard wagon which was one of the Victory Conditions. Meanwhile on the table behind us, Pat L. (aka Socalwarhammer) and Old Bob from Gresham, Oregon were playing out their Successor Campaign, also using WAB. Their 6 turn game ended in a tie. Scott M. was playing a nice looking Fields of Glory game - a ruleset I have yet to try. I think it was the Battle of Dara. 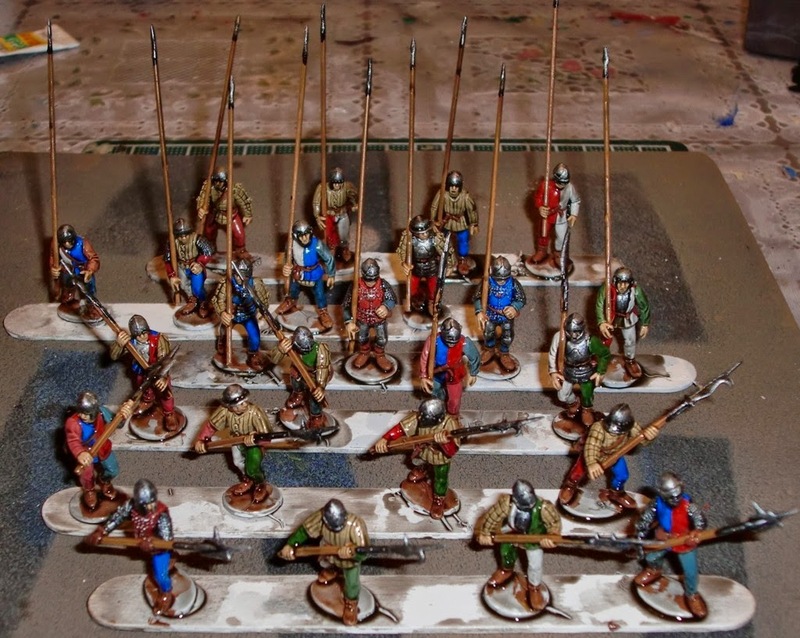 Here they are after being sprayed with Testors Dullcote, and given a bit of highlighting and inking. Vallejo Black Ink/Stain was applied over certain areas like the studs on the brigandine coats. They'll be based three figures per 40mm bases. Still waiting for another order of Litko plywood bases to arrive. These are the very nice Perry plastics. 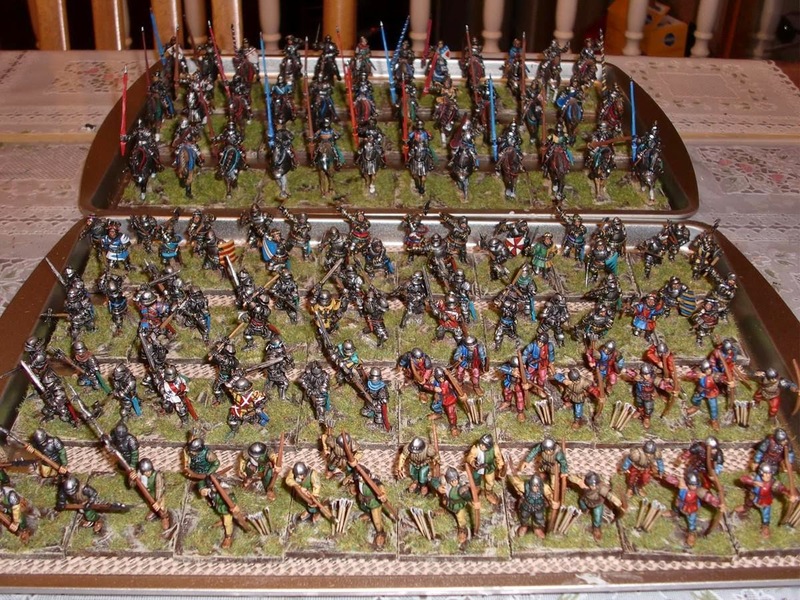 I had always wanted to do War of the Roses, but hesitated due to the thought of painting up a bunch of longbowmen. I'm glad I broke down and picked up the box of 40 infantry which can build 30 bowmen and a balance of billmen and command. Here they are with a fresh Minwax stain over a basic block paint job. Wanting a fairly uniform look for both forces, they are painted up using blues, reds, greens, yellows and white. 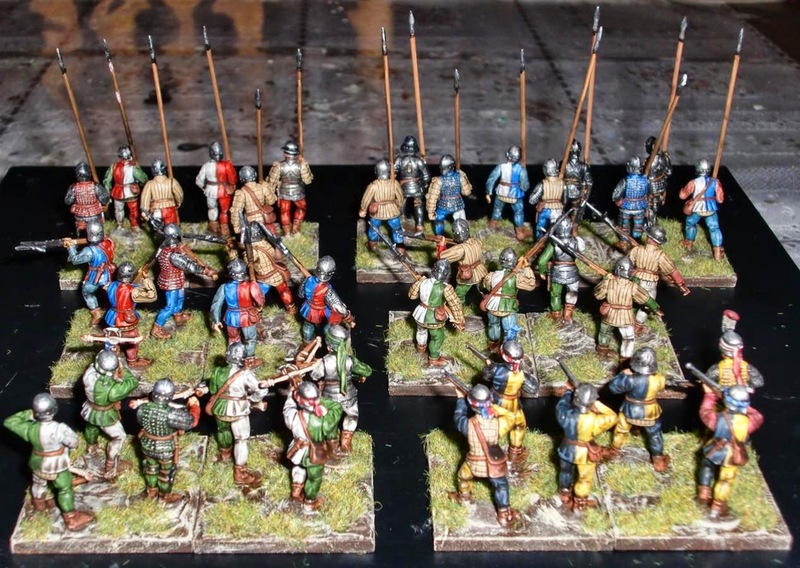 I'm planning to use them for a Bosworth game, so have a bit more bowmen painted up as Plantagenets. 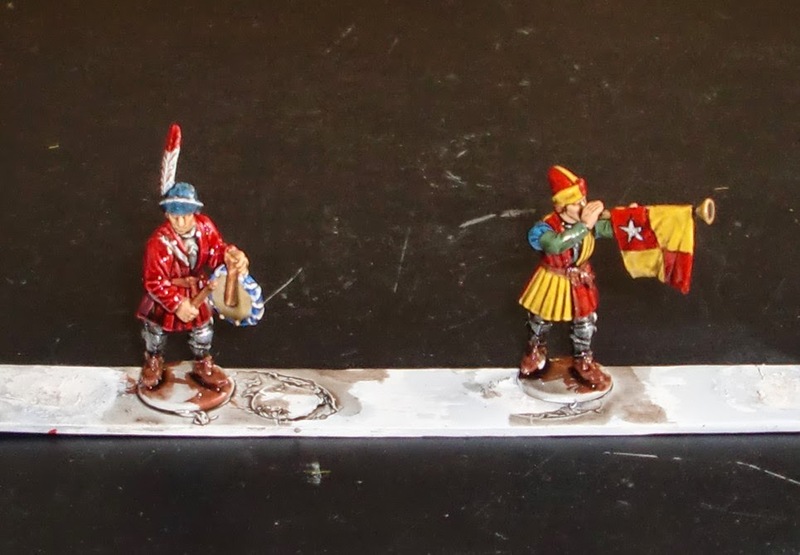 Also, the six billmen are painted up in Lancastrian colors. As Henry VII had a smaller force of French and Welsh included, I plan to use existing figures from a Hundred Years War French army.